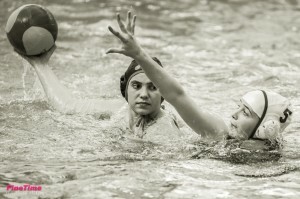 Fighting fit, fired up and full of fearsome new tactics from the fiendishly ferocious Hungarians post-tour, the Cambridge Women’s Waterpolo team faced 3 matches in 4 days. After Wednesday had seen a solid and satisfying trouncing of ‘The Other Place’; the team prepared to do battle against the Welsh dragons in Cardiff on Friday evening followed the next morning by Bristol… back in Cambridge. Well, I say in Cambridge but our ‘home’ pool in Northampton is still a good 1.5 hours’ drive from Cambridge. We set off for Cardiff at 3pm, leaving 5 and a half hours to get there in order to avoid the slight catastrophe that occurred the last time we attempted England’s traffic on a Friday evening to play Cardiff, whereupon our ETA kept ominously slipping later and later until we had reached Reading and realised that not only would we arrive after their pool closed but one car was an hour behind. If you can’t guess, that match didn’t happen. Despite this seemingly ample time, someone somewhere had decided to close seemingly every road and junction that we needed, so we arrived, leapt in the pool and rushed through our warm-up before swim-off. Quarter 1: Our short warm-up left our part-time goalie Lucy Morgan out in the cold, and some successful counters by Cardiff quickly left us 3-0 down. We soon got our act together and made sure we sprinted back to get our defensive arc in gear, with some strong defence put in by Ella Irwin and some excellent saves off one-on-ones by Morgan. A strong shot by Captain Schubert towards the end of the quarter lifted our flagging spirits, and in the interlude before the next quarter we were reminded to play with ‘High Intesnsity’. Quarter 2: We were now fully in the swing of things, and our capabilities emerged, with some excellent leftie shots by woman of the match Sarah Flaherty. Despite some distinctly questionable refereeing (we think he was mistakenly caught up in the emerging trend for whistle-blowing), with frequent turnovers, we held our own and caught up slightly. The third and fourth quarters were hard fought, and despite goals from Frances Turrell, Schubert and Irwin, including a bizarre allowance whereby the Cardiff goalie, poor lass, unfortunately managed to score an own goal when she brought the ball back to throw it her teammate. Chantelle Doran and Laura Robinson made sure the runaway goals of the first quarter were not repeated, keeping Cardiff firmly marked. Meanwhile, Kate kept her cool despite being mauled in an unladylike way to ensure opposition goal scoring was minimised. Sadly, the match finished with a final strong push from Cardiff to end with an 8-6 loss, but we played well… and then drove back- huge credit to Doran and Turrell in one car and Schubert singlehandedly in the other for the 10 hours driving! We face Cardiff again in less than a week… spoiler: the scoreline read very differently! Just about time for a quick nap (we arrived back in Cambridge at 3am), before a bright and early start to play Bristol! Raring to go, or semi-awake…I personally slept the whole journey and managed to miss a road block, two police cars and an ambulance, and possibly some interesting gossip…. A larger team- a full contingent of 13- was appreciated as we really could play high intensity against this team who beat us quite solidly last time. The first quarter. We were prepared for the strength of the Bristol team, and right from the word go made sure that we kept their strong players marked at all times, and as far from the goal as possible. Unfortunately, this seemed to make little difference to some, as one of their girls was as happy shooting from 10m as from 2. She notched up 3 goals in this section, and proceeded to score 69% of the team’s total. A tough opponent, one of a few which caused a fair few exclusions and an unfortunate penalty in the 3rd quarter. A lovely loopy shot from Frances Turrell ensured that we ended the first 7 minutes only 3-1 down, a marked improvement from the 12-1 of our first game vs Bristol. 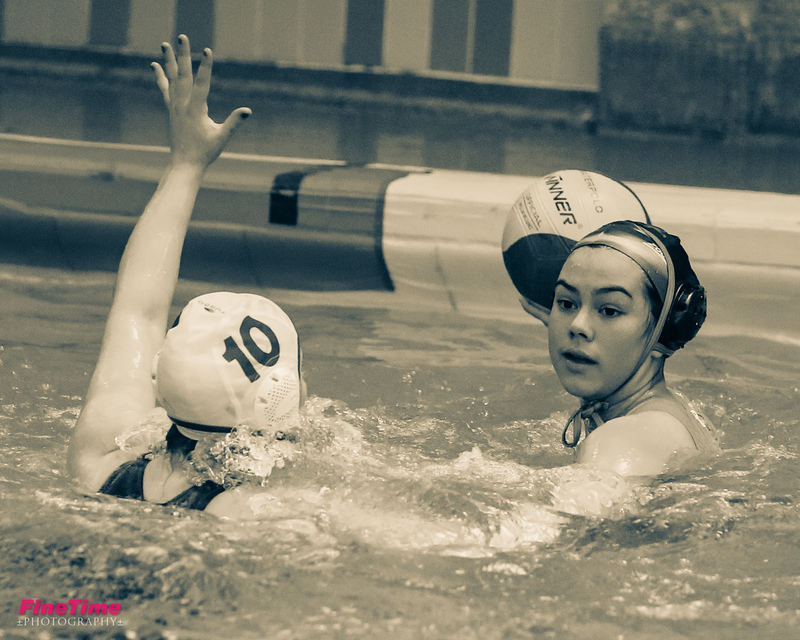 We then saw a lovely first ever BUCS goal from Becky Mackett, new to waterpolo this year, in the last two seconds of the quarter, and another beauty from Captain Schubert. Alas, despite some strong defence from Giardinello and Irwin, they managed to pop another 5 in, to reach half time 3-8 down. Regular subbing and a fighting spirit meant we kept Bristol on their toes and did not allow them to become complacent. A third set of 7 minutes saw two goals from Turrell and Schubert, though Flaherty was blocked by some solid defence. In a fit of enthusiasm, Captain Laura made a double-quick substitution of the entire bench… only to find that there were two seconds of the quarter remaining. By the fourth quarter it was clear that we were not going to be able to bring the match back, but carried on playing well, with a wonderful ending goal by Irwin, who had been doing a sterling job to keep a key player out of the match, and some great tackling by Katie Purohit. We finished 6-16, but on reflection we had played a very good game, and anyway Chantelle Doran had made brownies and flapjacks (for the one peculiar member of our team who actively dislikes chocolate) so we promptly forgot about everything else… until our good Captain reminded us that we had 2 hours before we had to be back in the Leys in Cambridge for our Saturday training. The team set off to Northampton not thinking about our slim chances: Bristol had defeated us early on in the year by a solid 19-9 margin and have reigned supreme in our league since as far back as anyone can remember. We never doubted ourselves; instead we made sure to focus on delivering the most hellish, mouth-watering game of water polo to ever scorch the surface of the earth. Adam Streeter massaged frankincense oil across his chiseled jawline in a pre-game routine that he picked up in the Middle East, while Patrick Charles gurgled the last remnants of his burger from Weatherspoon’s. Before we knew it, we entered into the post-apocalyptic expanse of water, knowing we would make history. 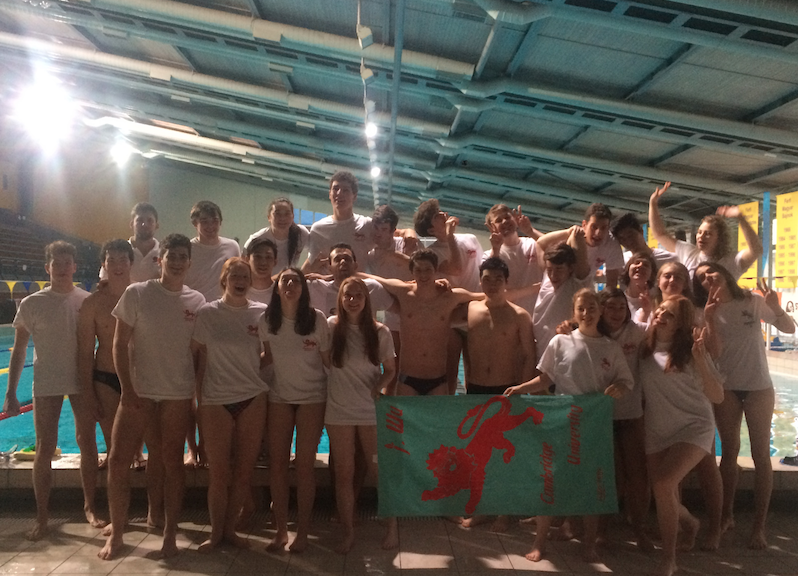 The Water Polo team taking on their opposition from BVSC on tour in Budapest. As soon as the game started, it became clear that Bristol wanted to play a rough game and were getting rowdy. However, a strong set-up by Cambridge meant that our skill triumphed the ball-crushing physicality they tried to impose. Some strong pressing, outfield blocking and great communication meant that their signature far out shots rarely converted into goals. 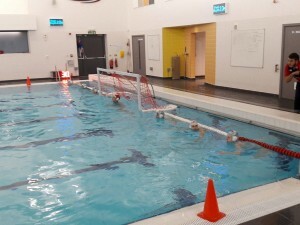 Fitness became our strength as we bolted up and down the pool, with constant rotation of players meaning everyone was at full intensity whilst in the water. The solid Light Blue defence meant we were behind by only a very narrow margin for a lot of the match, and Youssef Badr knew he needed to step in. “Join me in my journey to success” he exclaimed, splashing in with his thick, pornstar chest hair and a hand signal one could only interpret as “bless up”. He went on to win MOTM with a fantastic performance of solid deliveries and plays .With a great effort by this man and many others, we started leading. Rob Gourley kept the game spicy with a shocker of a goal from halfway that made even the shooters for Bristol gape in awe. By the final minute, we were tied and it became a gruelling battle to see who could score a game-winning goal. However, some impressive ‘keeping at the Bristol end meant it was not to be and the final score was 11-11. All in all, it was a great success and the boys should be super proud. Our game was strong as we combined a furious, blasting energy with calculating precision and thoughtfulness. Bring on the next! 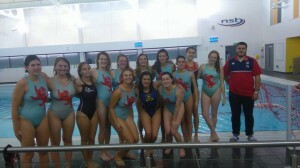 We arrived on poolside, jealous of Oxford’s polo facilities, and unable to breathe in our new suits. “Don’t react, grab them first!” was Laura’s rallying cry as the starting seven jumped in the water. It sounds like the motto of a lad-on-the-pull, but is in fact a totally legitimate water polo attitude to take. It certainly paid off for us, and we came home with an 11-4 victory, our second win against Oxford this year. The first quarter saw Cambridge take a comfortable lead, with Kate and Laura’s goals boosting us to 3-0. Oxford certainly did get the ball down and try to score, but Lucy was incredible at deflecting all their attempts. Having spent the past week facing terrifying Hungarian teenagers on winter training camp, she found the relatively gentle shots of the Oxford women easy to handle. In the second quarter, Oxford came back with a goal in the first 30 seconds. Their luck was short-lived, however, and that was their only goal of the quarter. Laura and Kate shot two more for Cambridge, so the score was a nice 5-1 by the end. It was also Liv’s debut in a match, and she did amazingly! In some ways, the third quarter continued just as the first two had – Kate and Laura scored goals. In other ways, however, it was a little different. 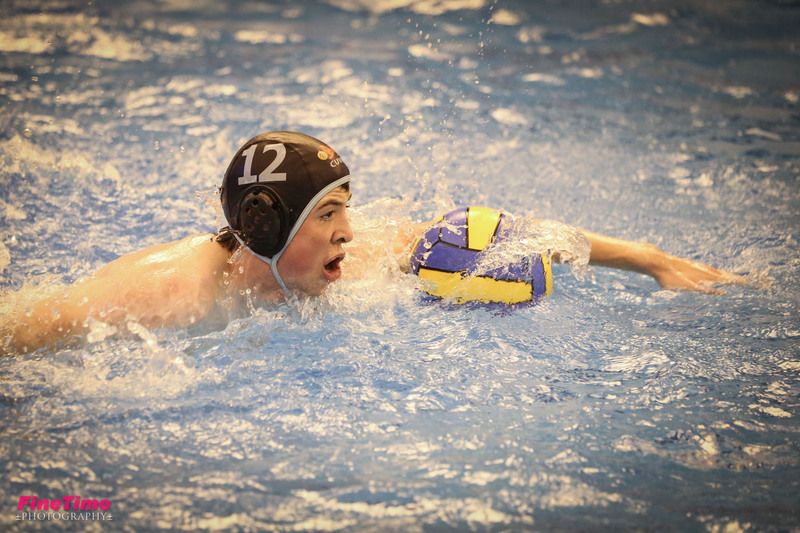 After graduating, Robbo’s college grandmother, Rosanna, made the unadvisable decision to move to Oxford, and to play water polo. Robbo was overcome by feelings of betrayal, and fouled her grandmother, which resulted in her being sent off. Once Robbo was back in the game, what was left of their familial relationship continued to disintegrate, as she managed to take the ball from her granny. This quarter also saw a ball mix up, which resulted in us playing with a men’s ball. Partly because we have hands big enough to deal with Size 5 balls, partly because we were grabbing first, and partly because Kate and Laura were on a roll, the quarter left us with an 8-4 lead. 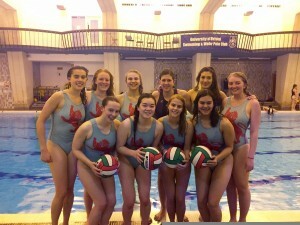 The final quarter brought in some new goal scorers, with Frances, Laure and Laura bringing the score up to 11-4. “But why did Kate stop scoring goals?” I hear you ask. Well, Kate and Lucy had swapped, and Kate was defending our goal against Oxford’s final attempts to equalise. Needless to say, they scored no goals. Players of the match went to Lucy for some fabulous saves which made it much less stressful for those watching on the bench! And to Kate, who literally was just picking the ball from them in defence, they couldn’t keep it and she did an excellent job of communicating and telling people where they should be. 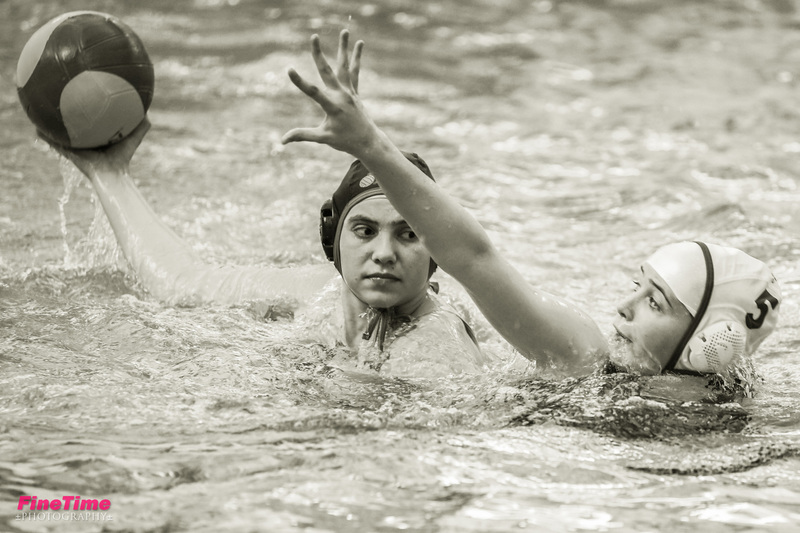 Overall, the match was fast-paced and fun, and a fantastic game to throw us back into a term of water polo! 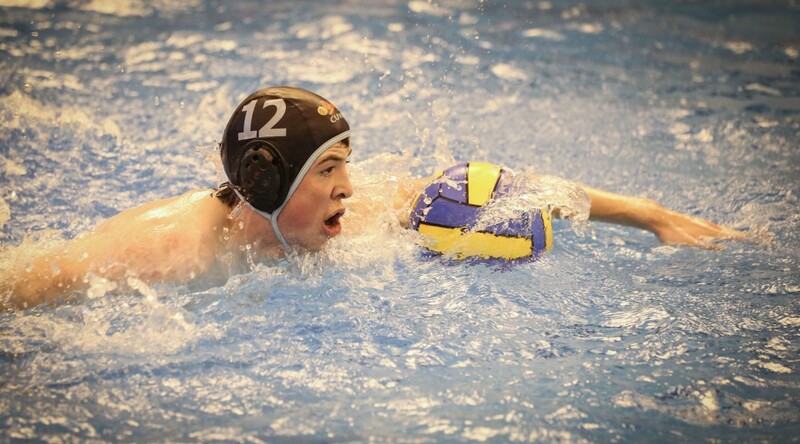 The first quarter was a tight affair with Cambridge finishing marginally behind at 3-2, after goals from captain Robert Gourley and young hotshot fresher Isaac Hinchliffe. Despite the close scoreline the boys were clearly off the pace. There was not enough of the vintage straight driving and lighting-speed counter attacks that had so troubled the Oxford team in the first meeting this year. Whether or not this was due to the lengthy car travel down or the insufficient warm-up, there was no denying that the Cambridge team were in a state lethargy. Unfortunately , this early slowness by the boys was not to go unpunished. In the second quarter Oxford wrestled their way into the driving seat, making good use of their physicality to capitalise on the lapses in concentration from the light blues. The quarter ended badly for Cambridge, at 8-4, leaving them a hefty task if they were to go on and clinch the game in the second half. Despite this, and what seemed like an early sucker-punch goal from Oxford to make it 9-4, the Cambridge boys came storming back in the third quarter and dominated the Oxford team. We started to see much more of that blistering pace that Cambridge usually use so well with speedsters like Alex Norcliffe and James Mok tearing up and down the pool and exposing the wilting stamina of the Oxford players. However, one man above any other sparked this Cambridge revival. In the third quarter the Rosenblatt crowd was treated to what one could only describe as the Robert Gourley show. The co-captain and ex-Great Britain star, hauled the team back into the game with a brilliant goal rush. Tearing up and down the pool, the man was clearly on a mission, leaving helpless defenders in his wake and mercilessly humiliating the keeper with a quite frankly offensive lob at one point. At the end of the quarter the bench reported his claims of back pain from “carrying the whole team”. However, it was not just the attacking prowess of Robert Gourley which got the boys back into the game. Even more vital was the even fiercer and more agressive defending for the team that ex-pit man Patrick Charles was at the heart of. He performed outstandingly at the back, keeping the the centre forward position under lock and key with some very smart and measured defending allowing us to stump the Oxf*** boys. After this revival, Cambridge were right back in the match at 9-7 despite also missing a fair number of important chances. The fourth quarter started in a familiar vain, with fresher Hinchliffe again popping up on five meters to sling in a clever bounce shot into the left hand side of the goal to put the Cambridge to within a goal of their ancient rivals. Unfortunately, however, the boys came to rue their missed chances and when the Oxford team eventually regained their foothold in the game, the match started to slip away in the dying stages, despite continued hard work from the Cambridge team. Although team golden boy and star player Ben Tinkler-Davies popped up late on to slap in from two meters in the dying stages, it was too little, too late. The game finished 13-10 despite a late flourish from Cambridge and the lads were left feeling disappointed but not disheartened by the game’s outcome. 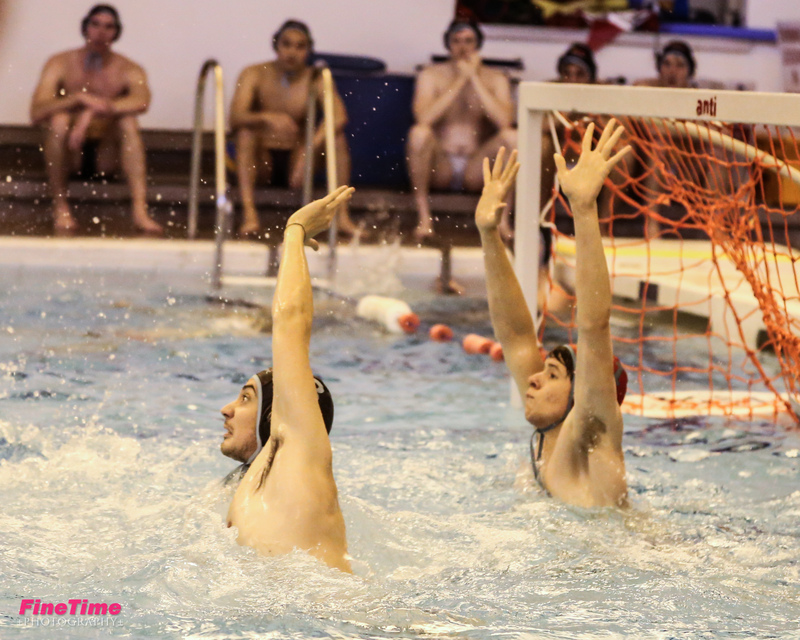 It was a very hard-fought game of fine margins, and will provide important lessons for the onslaught of BUCS matches to come this term and fire on the team for the imminent varsity match in Cambridge on the 25th of February. A valiant performance by the light blues and one which leave them confident they can progress as a side as the season continues. So the girls were alone on this long Bridgemas route. Didn’t make it to Cardiff, we were minus one team! A Bridgemas miracle! – Kind strangers answered our plight. Christmas markets and scones and lovely new friends. “On, Ella, Frances, Ailsa! On, Laura and Katie! A brilliant goal followed by a second from Captain. While pushing top players out stopped their goals from happ’ning. Including one-on-one’s – she was on a roll! And Lara her great first in quarter four. Cambridge’s final score of 5-7 meant victory! And Francesca’s defence and Lara’s goal – amazing! Happy Bridgemas to all, and to all a good night! The car ride to Bristol was both scenic and life-threatening (shout-out to Nicola for an interesting interpretation of the highway code). We stopped for a light snack at a lovely little hole in the wall where we quickly carbed up for the war ahead of us. On arrival, after a brisk warm-up, the game was afoot. The first quarter was neck and neck, some truly great polo from us and some dubious refereeing resulted in the quarter ending 4-4. The second quarter is, unfortunately, where the game ran away from us for a variety of reasons, namely fitness and team chemistry. 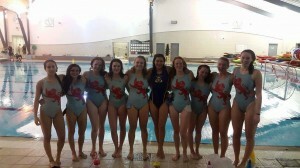 However, I do believe we played the better water polo (especially in the first and third quarters). One particularly memorable moment was the heavenly lob from our TJ, Ben Tinkler-Davies (BTD). The ball soared into the top corner smoother than anything. Another lovely moment was the penalty save from Brian in the final quarter, where he read the opposition like a book getting not one, but two hands to the ball and cradling it back to the safety of Cambridge possession. Goal Scorers: Adam (2), Rob (2), BTD (2), Isaac (1), Alex (1), Youssef (1). Final score: 19-9. Mainly those with names beginning with L were voted for: Laura (Robinson), Laure (Talarmain) and Lara (Tritton) and Ailsa (Kiely) for their first BUCS match which is a big step up. Lucy (Morgan) for super passes in attack, in the right place at the right time. 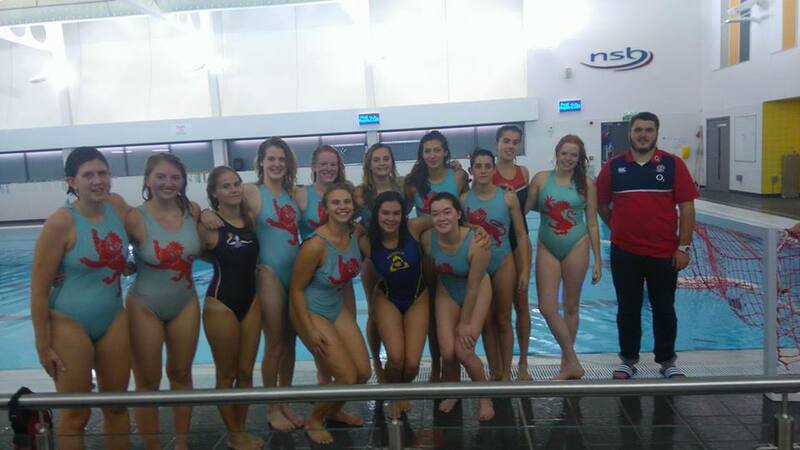 The first BUCS (National University League) match of the season was against the previous top team in the first division- Bristol. It’s early in the year, and the team have been training together for only a month, with the new coach Bygraves standing by at every match, making sure we play our best. 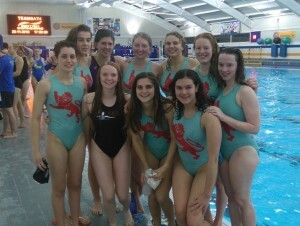 But The Cambridge Women’s Water Polo team were keen to travel up early to support the Cambridge Men’s side. Music on the way up included Berlin’s club scene style (for 4 hours as this was the only CD present) and though legal parking in Bristol’s Clifton is hard to find, we all got to the university’s pool on time. 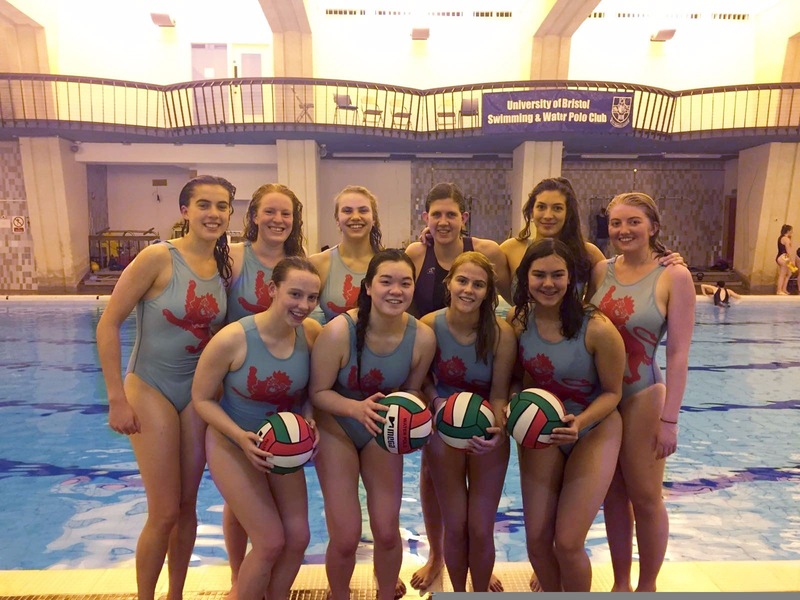 After watching the Cambridge men intensely, the 10 women showing a threatening (winking) lion on their costumes entered the water, warming up with their brand new, Christmas themed and super grippy water polo balls. Many one-on-one counter attacks kept goalkeeper Benezit busy, and with the lack of defensive support it was hard to keep the goals from whizzing into the corners of the 3m wide goal. Another man-up situation was created as Bristol’s Pitsika got excluded for swimming over the top of Schubert, and though passing was speedy to keep the goalkeeper moving, no shot got through the strong defence. A lost hat from Irwin caused a short kerfuffle, a dive down to the bottom of the pool to retrieve the hat. But for now she had swapped from number 8 to 13. With 2 exclusions from Schubert and Turrell, and a number of speedy counter attacks, Bristol scored another 6 goals in this quarter, and at the loud bleep after those 8 minutes of play we swapped ends, refuelled from our bottles and relaunched. What had happened to give a 12-1 at half time? And could we make a comeback? Bristol was strong- we new this, as they are one of the best teams in the country. Their national player Dean was in the water having scored a third of the goals against us. But turn it around we did- in the second half. The next 8 minutes of play were collected, careful and what we wanted and needed. Feng with her swimming ability sped down to the corners, often free for the perfect pass, and helping us to get the ball down to attack, then a quick pass, then shot. Within the first minute, Turrell got the ball to the back of the net- one of her classic loops scoring our second goal. Another exclusion from Schubert saw 20 seconds of man-down defence, during which Dean scored once again. But not disheartened, we launched attack after attack and made sure to sprint back in defence to catch those counters. Tritton and Talarmain, still new to the team, took on players wherever needed, their awareness being a great asset and Robinson took some mighty shots, her increasing confidence in attack showing through. Thanks to Kiely’s hard work in attack to get free from Bristol’s tight grabs and moving into the right positions, another attack resulted in a shot from Turrell, securing our third goal. In the last minute, direct from a centre ball after Bristol’s 15th goal, a quick careful pass over the top to Schubert saw her score, to end the quarter with a much improved score of 12-4. With our new grippy balls! We are now looking forward to the next BUCS matches against Cardiff and Bath. The day started quite well, as most of the team turned up at the right place at the right time. Except for the keeper. He was nowhere to be seen. But we set off nonetheless, and after picking up our star player Youssef from Churchill we headed for Warwick. It was only logical that he should get on-demand chauffeur services because he had to preserve as much energy as possible. The chauffeur service paid off because he performed some cheeky manoeuvres, apparently leaving both teams in awe. Not quite sure what exactly he did, but considering he spent an hour mentioning it, it must have been pro. There were some nice shots (almost goals) by Cam Wallis and Youssef Badr. Warwick’s 1st team was quite aggressive but no one got too seriously injured, though the blow to our egos was catastrophic. Igor failed his aim of respecting the rules and got sent out in the first minute of play. Of course the team lived up to their brainy Cambridge name by failing to count to 6 and the second quarter almost started with more than half the team out of the water. In other parts of the pool, #roadtofirstteam Leo decided to debut as a keeper in the BUCS league and did a solid job. He is quite sad to report that this was also his last game as keeper in the BUCS league and he hopes that everyone who supported him can respect his decision. At the end of the game Peter went missing in his search for a vending machine, which turned out to be 5 meters away from the changing rooms. But we found him eventually, and even learned the most efficient way to contact him: by email, for future notice. On the way back we made a quick detour into Leicestershire after Youssef’s stellar performance as co-driver. Everyone bailed on the post-match Maccy D’s so they were not able to watch Igor attempt to shark on the UEA badminton team. Shoutouts to Lafferty for top notch hat carrying as TJ. MVP goes to Leo for stepping up to play keeper (still trying to find the actual keeper, if anyone knows where he went…). The score will remain unmentioned because it’s not something anyone wants to think about, ever. The team lost – by a lot – but in doing so, they gained conviction and hope for the future. It might have been short notice, 48 hours in fact, but with high team spirits from our win against Oxford on Sunday, we rallied the troops and eagerly awaited our 3rd match of the season against the Surrey Stags. After our busy days and the challenge to even find our zip cars, we finally set off with Spotify in toe and made our way to Surrey’s incredible pool. It knocks the socks off ours, but The Leys is home and we love it (ish)! 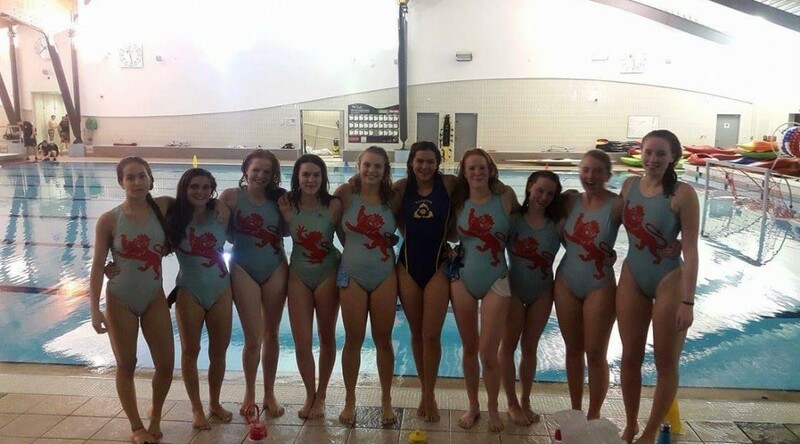 Upon meeting Surrey’s captain, we were once again expecting a friendly Upolo match because, like us, they also had newbies on their team; and apparently the girls weren’t planning on any costume grabbing in the game – oh, how times changed when the whistle was first blown! Still, a massive shout out here to Katie Puhorit (‘always on the wing when needed’), Beki Mills and Eleonora Garau for amazing first matches for Cambridge – we’re so proud of you girls! Our first quarter was hugely promising, with goals from Lucy Morgan [(wonder) woman of the match for amazing attack, goal scoring, as well as a fantastic attempt in goal! ], Ella Irwin (always on form) and, our very own captain, Laura Schubert. With only 2 goals being scored the Surrey ladies, we were up and on target after the first 7 minutes. Lucy Morgan scored again in the 2nd quarter, with a fantastic shot. So, despite a 3rd goal by Surrey’s Buttle, we were leading 4-3 at the halfway stage. Hopes were high after our 3 newbies all played fantastically, making their debuts in this quarter. Despite this, it was perhaps the 3rd quarter and lack of conversions in these 7 minutes that saw our weakest part of the match. Legs were tiring and, unfortunately, with fouls not being blown (to our new coach Ashley’s dismay), it was all-square with only the final quarter to go. We weren’t giving up though because that simply is not the Cambridge way. The last quarter was exceptionally tight, with Schubert and Irwin once again showing what fantastic players they are, scoring 2 and 1 goal(s), respectively. The scoreboard remained at 7-6 for a while, and we had so almost clinched the victory. We defended hard, but the home captain showed her form and with less than 1 minute to go it was 7-7. With 42 seconds to play, we had one final attack, only for Irwin to come so close by hitting the bar. The final 34 seconds were, therefore, extremely tense as we could not allow Surrey to score in their final counterattack. More nerve-wracking still was that the Surrey girls were awarded a corner with 5 seconds to go. Screams like “press” and “play down the clock” came from the bench, and that’s exactly what we did. The final whistle was blown; and, although we were so close to the victory, a draw of 7-7 is still one to be proud of! It may be a goodbye for now, but roll on Saturday against Bristol. Good luck girls – you’ll ace it! The first time we face O*ford this season – game one of three, culminating in the most important match of the year. And what a wonderful match it was. The second match of the season brought in more new players and a better-established strategy regarding the attack. We did some good passing down the wings to work it found the arc. 2-first-quarter goals were from Frances Turrell and one was from Captain Schubert (her first of many this game). That along with our solid defence gave us an early lead, putting pressure on Oxford for the rest of the match. The second quarter was a little tougher with one shot sneaking past from O*ford returned only towards the end of the quarter by Schubert. But still an impressive commitment from our defence prevailed, even through several man-down situations; thanks to the defence and Bénézit’s goal keeping we managed to keep the 3-point gap. We got back to our top form in the third quarter with 3 points scored by Schubert and Irwin, setting up some formidable attacks and getting the whole team involved for the goals. Our cohesive performance and the use of a pre-game tactics session paid off and we kept our focus throughout. But it may be time to bring back the ‘more you shoot the more you score’ chant as a few opportunities for scoring went unused after hard work to get the ball in. However, the final quarter brought with it some tiredness – as can only be expected after a hard worked game. The result was a few missed opportunities, especially when attempting new man-up defences. Three shots still whizzed past the O*ford goalie, as we managed to keep our spatial awareness and keep our eyes on O*fords defence. And so we maintained our three goal lead from the beginning, and held on for a win! Huge congratulations to Hobson and Tritton for their first games playing for Cambridge, and to Schubert for an incredible scoring record, and determined play earning her the title of woman of the match!